Chalet Yvonne is in a great location for a holiday cottage. A community shop and cafe opened nearby early in 2014 – it’s only a couple of minutes walk away and you’ll find home-made cakes, breakfast rolls and light lunches, as well as grocery supplies. There’s plenty to do within walking distance and this self catering rental is also very well placed for touring the Isle of Lewis, while you can be in Harris by car in around 35 minutes. There are three different sea-shores within a ten minute walk of the cottage. At the Braighe, about a quarter mile from the property, the south facing beach is a mixture of sand and shingle, quite popular for fishing and occasionally a spectacular place to view stormy seas if there is a very strong southerly wind. 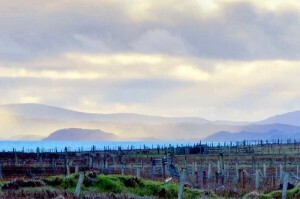 Views from here are to the Shiant Islands, the Harris hills and the Scottish mainland. The north facing beach has more sand and less shingle. Although mostly only around 50 to 100 metres away from the south beach, it’s generally quieter and more sheltered. During the darker months from September to March, this can be a good spot to view the Aurora Borealis if the conditions are favourable. Just down the lane that passes the cottage, you’ll find a smaller, stonier shore – unknown to most visitors and locals, so it’s very quiet – an even better spot to watch out for seabirds. The entire island may amaze you with its variety of birds and mammals. At the nearby beaches and around the crofts, subject to weather and seasons, you are likely to see fulmars, gannets, guillemots, shags, arctic terns, skua, buzzards and moorland birds. 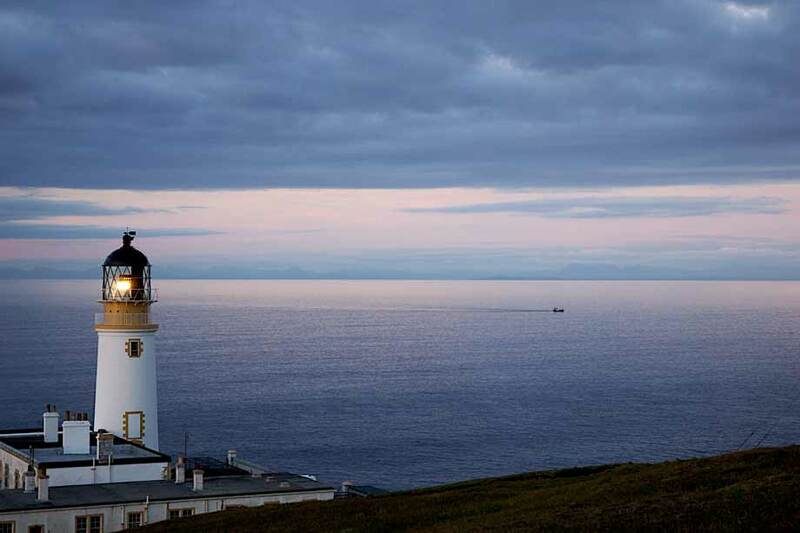 Take a trip to Tiumpan head, about 6 miles further into Point and you can watch nesting seabirds on the cliffs from the hill above the lighthouse (carefully, with a scope, as the land slopes away steeply). From the same area, you may see dolphins and whales (rare occasions but worth a look). 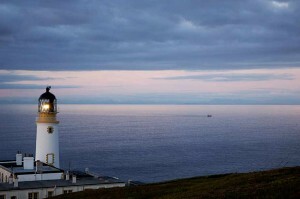 Stornoway (under 10 minutes by car) has a good selection of shops, some offering quality local produce, art and crafts. There are two supermarkets and good independents supplying meat and delicatessen products. Also in Stornoway, the castle grounds, with the River Creed and waterfalls, are excellent for walking and have mountain bike trails, too. An Lanntair is an arts centre with regular performances, plus cinema and exhibitions. The closeness of your holiday cottage to Stornoway makes it practical to fetch home a takeaway if the fancy takes you. There’s Chinese, Indian, Thai, pizzas, fish and chips and, especially noteworthy, Eleven Express, where you can choose your own courses from the restaurant buffet – a new menu every day! Visit the swish, flagship store of Harris Tweed Hebrides in North Beach Street, where you can buy designer clothes, accessories and loose cloth. Then go to the Lewis Loom Centre in Cromwell Street, where Ronnie enjoys sharing his lifetime’s knowledge of weaving and has Harris Tweed products for sale. 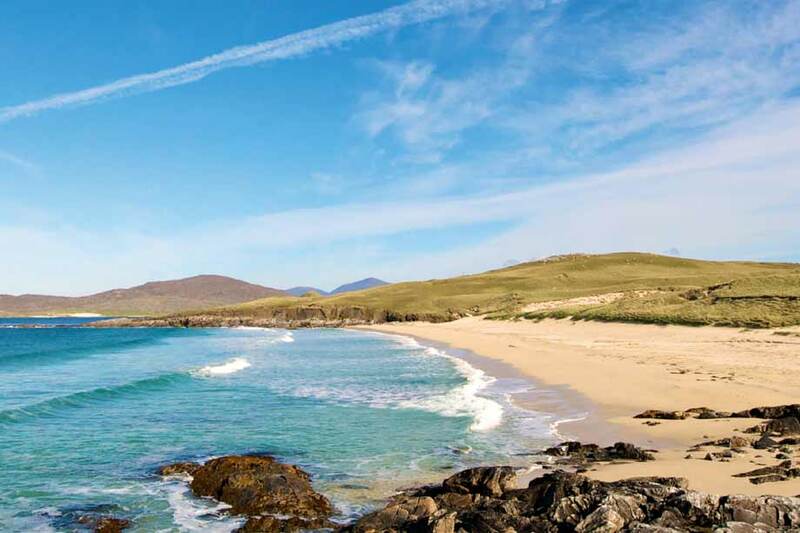 You could easily spend several days discovering the Braighe and Point areas, the coastal paths, Tiumpan Head with its lighthouse, the sheltered sandy beach at Bayble, moorland walks above Garrabost – all pleasant diversions that don’t feature on the coach trip itineraries. Further afield, Callanish is the ‘must see’ unforgettable attraction of the Outer Hebrides and is only about 30 minutes drive (21 miles) from the holiday cottage. Dating to around 2000BC, the Callanish Stones are a dramatic monument to man’s determination, for they are of enormous bulk and would have required tremendous effort to be placed in their location. No charge is payable to visit the stones – and refreshments are available. After visiting the Callanish Stones, drive north a few miles to the conserved village of black houses at Gearrannan. For a small entry fee, you have the freedom to roam a typical Hebridean blackhouse, furnished as it would have been around the 1950s. The entire village is fascinationg and a great place to take photos. 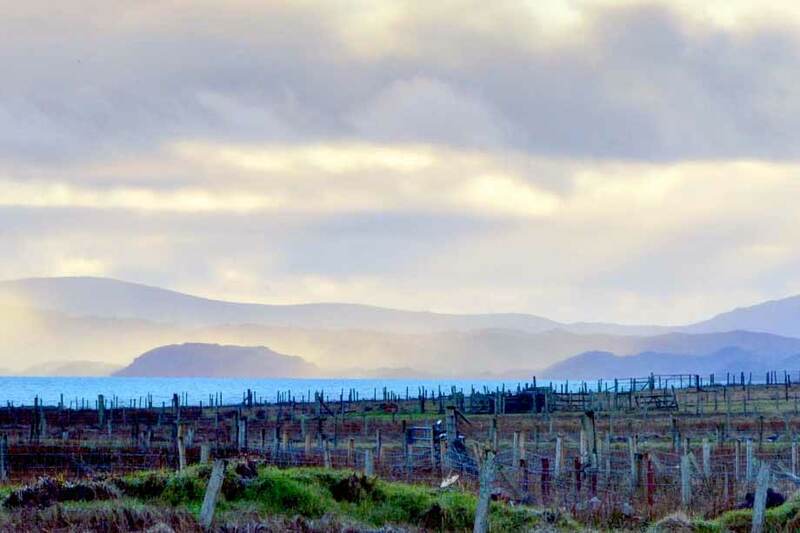 Then follow the main road back southwards to Garynahine, where you can turn right on the B8011, visiting the magnificent beaches of Riof, near Meobhaig, and Uig at Ardroil, then drive the coastal road with dramatic views over the cliffs at Mangersta. 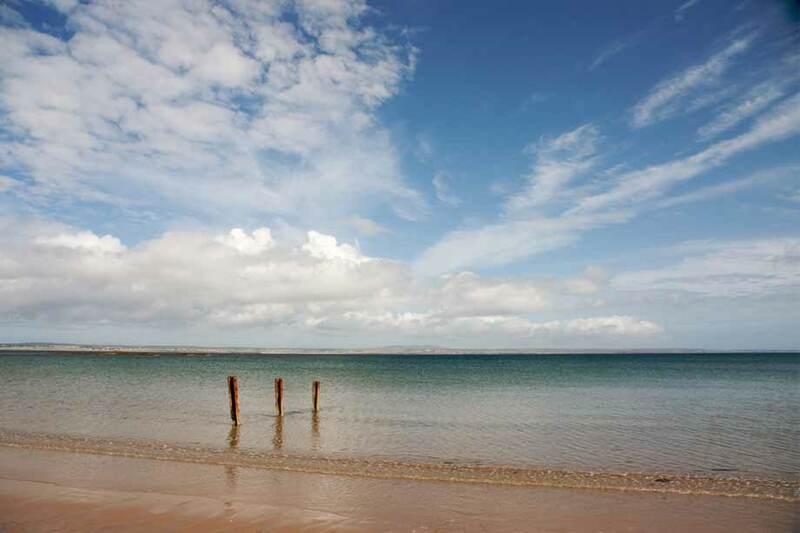 Only 14 miles from Stornoway, there are two wonderful sandy beaches at Tolsta, Traigh Mhor and Traigh Ghearadha. 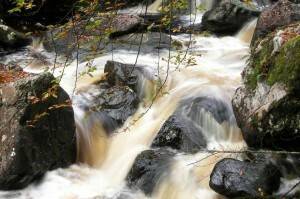 Or drive to the enchantingly beautiful Dalmhor and Dalbeag – to the north-west of Stornoway. Since the opening of a wide new road, it takes less than an hour to drive south over the Clisham mountain pass to Tarbert, the main town on the Isle of Harris. Visit the Harris Tweed shop and look out for the old-fashioned hardware store – perhaps the most photographed shop in the Hebrides. After a few minutes spent exploring the town (little more than a village, really) resume your journey southwards and within 15 minutes or so, you’ll be among some of the finest beaches you could ever imagine. 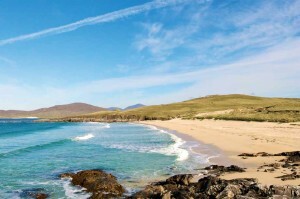 Take a diversion off the main road to Luskentyre (Losgantair), before venturing further down the coast to visit Seilebost, Nisabost, and Scarista. If you’re a golfer, you could play the challenging 9 hole Harris golf course – no other course can boast such views from its fairways. Leverburgh is a good place to stop for refreshments, before continuing the journey to Rodel, where you should not miss St Clement’s Church, built between 1520 and 1540 and restored to good condition. This fascinating church houses stone tombs of the Macleod clan chiefs. Return to Tarbert via the Golden Road, meandering through ‘the Bays’ – an area of small settlements, lochs, sea views and a rocky, barren landscape described by some as lunar.